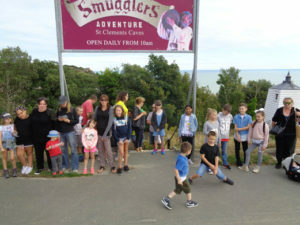 We had booked for the day a visit to the Smugglers’ Cave and planned a picnic and rides in the Funicular Railway to the top of the West Cliff. 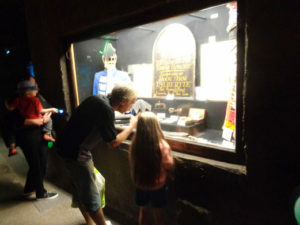 The Smugglers’ Cave is an interactive museum on the history of local smugglers, including ‘notorious Hairy Jack’, cleverely assembled inside a complex structure of underground caves and tunnels originally dug by smugglers in Hastings under the West Cliff. For more information about this interesting place click here. The day did not start well, as, due to an accident there was a traffic jam on the A27 which blocked our coach for long time. Unfortunately, this prolonged our journey by around an hour. On the bright side, however, like every ‘crisis’, the situation created an atmosphere of solidarity and collaboration on the bus, with parents discussing alternative routes with the driver and helping us with keeping up the moral. Thank to our good spirit and collective efforts we made it! 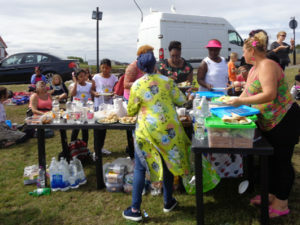 Fortunately the minibus carrying the food had managed to avoid the worse of the traffic and picnic was already being laid out when the first group reached the top of the cliff. The picnic was on a large green area on the West Cliff, with a splendid panoramic view of Hasting and the sea. It was a warm and sunny day, so the picnic was also an excuse for our children to play freely on the lawn, safe from the traffic. 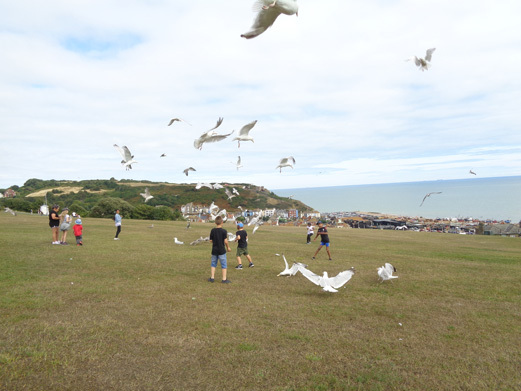 The naughtiest children also used pieces of food to attract hundreds of seagulls. What happened next was spectacular, with children and seagulls running and flying around, and lots of excited screams (and plenty of laughter) from the lot. 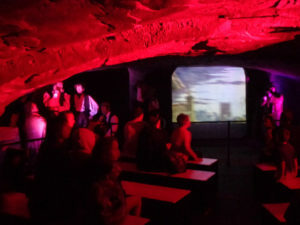 This fun was such that it was hard for us organisers to re-impose ‘order’ and lead the large group to the entrance of the Caves, on the side of the hill. 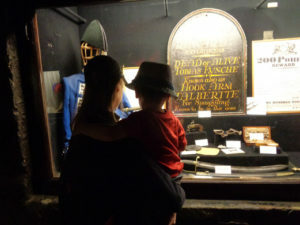 The visit to the museum was later than planned, but the Smugglers’ Cave’s manager was very accommodating and reassured us that there would be no problems. 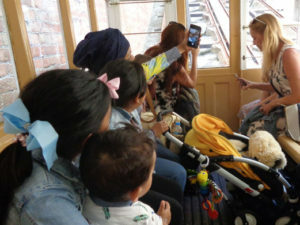 It was again difficult to get the excited children and their exhausted parents out of the museums in time to catch the train back to the seafront, before closure of the Funicular Railway. ‘I wish the day never came to an end. A wonderful worth while trip not to be missed. I could do it again. Thank you so much’. ‘This was a lovely trip. Enjoyed visiting the Hastings Caves. Thank you very much. ‘Thank you, was very interesting day and the kids loved it (especially being scared!). Train ride was scary!’.